Your five dice represent your tribe of Delvers. Every turn you'll choose one die to roll on a specific Ruin. Your Delver cards can be played before this roll to enhance your efforts. Claimed Ruins cards bring your tribe points, and high rolls help you claim Ruins. Select your Ruins wisely. The more Ruins you have of the same color, the more points you'll receive! Roll a 1, 2, or 3 with any die, and you get to take a Stone from the Ruin. Create a ring of 6 Stones to build a Wonder. Some Wonders give you points, while others offer special abilities. When the End of Age card apears, time is running out. When all Ruins have been claimed, total your points from Wonders and sets of Ruins. The most points wins! Use your Delvers well. Compete for the Ruins that will give you the most points. Build the Wonders that will give your tribe the advantage. Return your people to their former glory. You (and your tribe of Delvers) are competing with the other players to claim the most Ruins and gather the most Stones, which are used to build Wonders. 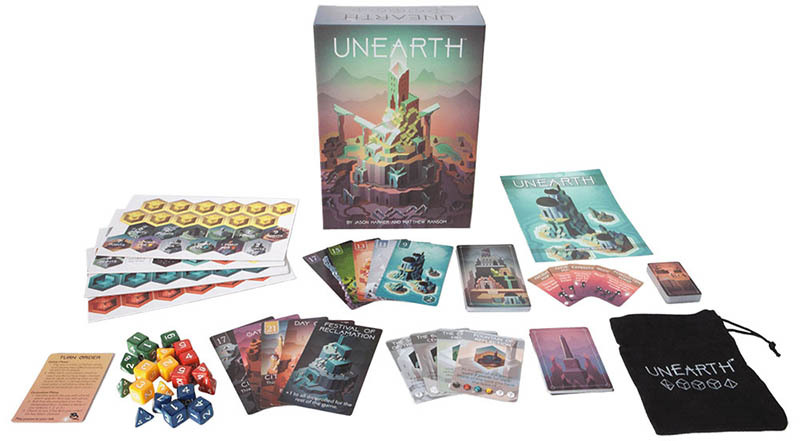 There are multiple paths to victory in Unearth. Ruins are claimed by whoever has the highest die on that Ruin, so rolling high can pay off. On the other hand, Stones (used to build Wonders) may only be claimed by rolling low. Both Ruins and Wonders confer points at game's end, so craft your strategy carefully. Place all of the Stones tiles in the cloth bag. Shuffle the Delver Deck. Deal each player two Delver Cards. Shuffle the Ruins Deck and deal one Ruins card facedown to each player. (YOU may look at your own card, but keep it hidden from the other players until the end of the game). Remove the top five cards from the Ruins Deck and place them back into the game box without looking at them. Shuffle the End of Age Deck, randomly choose one End of Age card, and place it on the bottom of the Ruins Deck. Put the rest of the End of Age Cards back in the box without looking at them. Reveal five Ruins cards and them face up onto the center of the table. Randomly draw Stones from the bag and place a number of them on each Ruin as indicated by the hex-shaped icon in the bottom right corner of each Ruin. Shuffle the Named Wonders deck and draw Wonder cards equal to the number of players plus 2. Arrange them on the table and place their corresponding tokens on top of each. Put the unused Named Wonder cards and tokens back in the box. Shuffle the Lesser Wonder and Greater Wonder tokens and stack them face down on top of their corresponding cards. Roll to see who goes first. After the first player has taken their turn, play proceeds in clockwise order. The standard set up described on page 2 is for a 3-4 player game. For a 2-player game, set up the game as detailed on page 2, but after dealing each player a facedown Ruins Card, remove 10 Ruins Cards from the deck (instead of just 5) and reveal only 4 Ruins Cards onto the center of the table at a time (instead of 5). Each Player's turn is composed of two Phases; the first is optional. You may play any number of Delver Cards from your hand. Delver cards are resolved immediately in the order they are played, and then discarded. Some Delver cards result in rerolls of dice already in play. 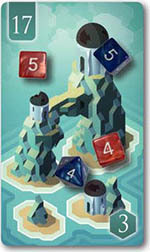 You must roll one of the dice from your pool and place it on a Ruins Cards in the center of the table. This is your Excavation Roll. You must declare which die you will roll and which specific Ruin you will roll on before you roll the die. After your Excavation Roll, play passes to the person to your left. After any die has been rolled or rerolled, or a card has been played, check to see if any Claims have been resolved. When you roll a 1, 2, or 3 during either phase, immediately take a Stone of your choice from the Ruin you rolled on and add it to your tableau. If there are no Stones on the Ruin, you must draw a random Stone from the cloth bag and add it to your tableau. Delver cards and Named Wonder effects may never lower a die result lower than 1, nor may they raise the result higher than the highest value of that die. Only you may play cards during your Delver Phase and cards may not be played by anyone during the Excavation Phase. Rerolled dice remain on the Ruin they were previously placed on. The owner of a rerolled die always performs the reroll, even if forced to do that reroll by another player. 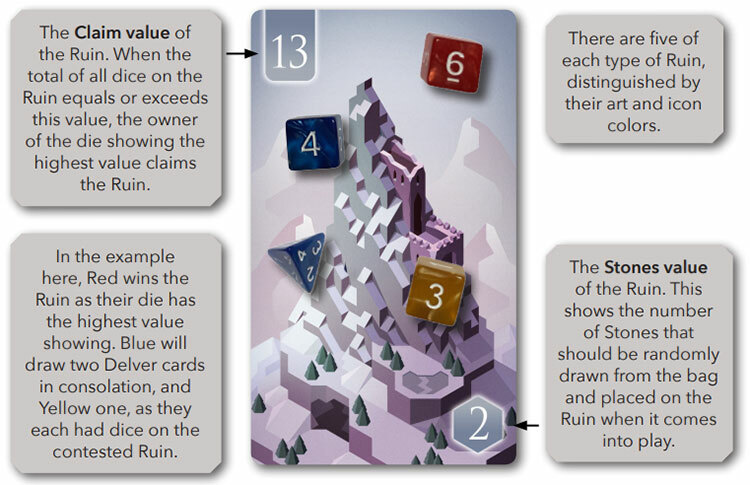 Whenever a die is rolled, rerolled, or a card is played, check to see if the total of all the dice on any Ruins Card is greater than or equal to the claim value of the Ruin. If it is, the Ruin is claimed by the player with the highest individual die result. That player then adds the claimed Ruin, face up, to their collection. The player(s) that did not claim the Ruin draw cards from the Delver Deck equal to the number of dice they had on that Ruin. Reshuffle the discard pile to make a new Delver Deck if the draw pile is empty. 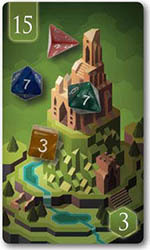 Once the Ruin is claimed, return all dice to their owners and return all Stones remaining on the Ruin to the cloth bag. Then flip up a new card from the Ruins Deck and place it in the space vacated by the just claimed card. Place Stones on the new Ruin, as indicated by the value in the bottom right hexagon on the Ruin. The Claim value of the Ruin. When the total of all dice on the Ruin equals or exceeds this value, the owner of the die showing the highest value claims the Ruin. In the case of a tie when resolving a claim, the die with the higher number of faces (the "bigger die") wins. If the tied dice are the same dice type (i.e. both six-sided dice), then compare the second highest dice of each tied player, continuing to compare "next highest dice" until the tie is broken. If a player doesn't have a second die on the Ruin (or third, fourth, etc) then they are assumed to have a zero value for the tie breaker. If there is an unbreakable tie (e.g. only two opposing six-sided dice showing the same value), no one gets the Ruin Card (place it back into the box) and all players draw a Delver Card for each die they had on that Ruin. In this example, the red eight-sided die showing a 4 beats the blue six-sided die showing a 4. Red's "bigger die" wins. Here, Red and Blue are both tied with 5's on their six-sided dice, so Blue's "bigger" eight-sided die showing a 4 will beat Red's six-sided die, also showing a 4, in the tiebreaker. An unbreakable tie. The Ruin is removed from the game and all Players draw Delver cards equal to the number of dice they had on the Ruin. Whenever a player rolls a 1, 2, or 3, they gain a Stone from their declared Ruin (or the bag if no Stones remain on that Ruin) and must immediately place it in their tableau connected to any previously placed Stones. 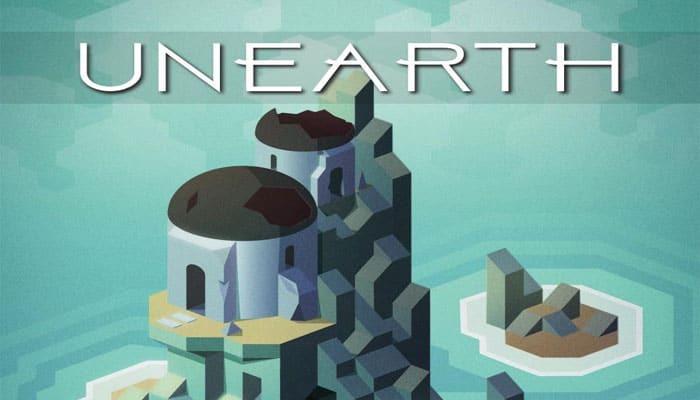 Players score points by using these Stones to build Wonders: hexagonal rings of Stones with an empty space in the center. If the Stones used to make the Wonder are all the same color, fill the empty space with a randomly selected Greater Wonder. If the Stones contain more than one color of Stones, place a Lesser Wonder in the empty space. The Named Wonders in play may be placed instead of a Greater or Lesser Wonder, but each require a specific collection of Stones to be built. Regardless of the Wonder built, Stones may be arranged in any order in the hexagonal structure. Greater and Lesser Wonders should be placed point value face down, viewable only by their owner. Stones may be used in multiple Wonders , but once a Stone has been placed, it may never be moved unless specified by some other card or game effect. 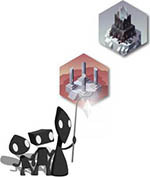 In this example, the player has previously built a Greater Wonder using 6 black Stones. They've added to two of the stones from the Greater Wonder to build a Named Wonder, and are now finishing a third Wonder attached to the first two. 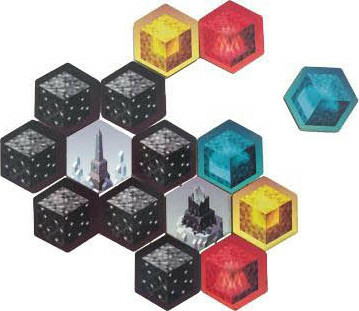 Because the third Wonder will have multiple colors of Stones in it, and not meet any formula for a Named Wonder, the Player will have to fill the empty space with a lesser Wonder. Each Named Wonder token has a matching card detailing its effects and construction requirements. This card should be placed in the player's play area, and their instructions followed, once the Wonder has been built. For example: Tomb of the Last Age grants points for each color of Stone you have at the end of the game, and must be built within a ring consisting of one black Stone, one red, one blue, one yellow, and then two Stones that may be of any type. This Wonder must be built within a ring built from 3 Stones of one color and 3 Stones of another color. This Wonder must be built within a ring built from 2 Stones of one color, 2 Stones of a second color, and 2 Stones of a third color. This Wonder must be built within a ring of 3 yellow Stones and 3 additional Stones that may be of any combination of colors. Note that the location of Stones in a ring does not matter. The formula only dictates type of stone, not position in the ring. 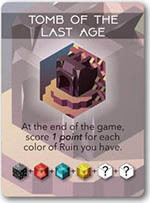 After all of the Ruins Cards have been flipped up and placed in the center of the table, there is one card left in the Ruins Deck: the End of Age Card placed there at the beginning of the game. Reveal the End of Age Card the same way you would reveal the next Ruin, and do what it says. If it is a new Ruin, place Stones on the Ruin as you normally would. If it is an Event, follow the instructions on the card. The game continues until all Ruins on the table (including those placed during the End of Age) have been been claimed. 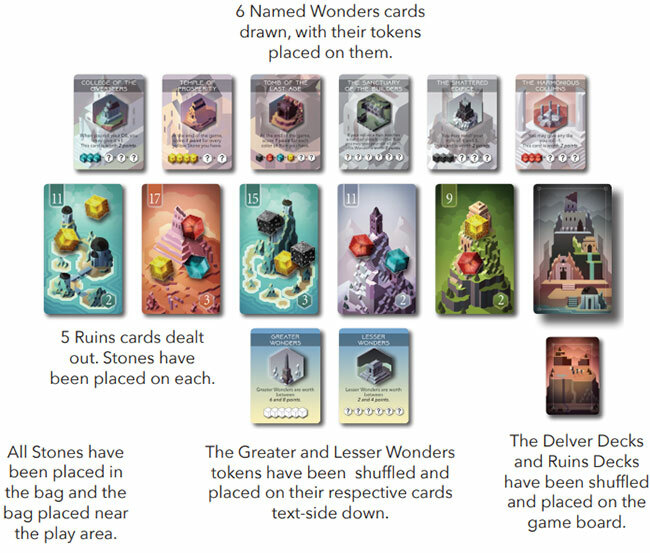 Players reveal their hidden Ruins Card and score points for each set of matching Ruins Cards they have, as shown below. 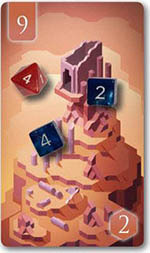 Players score an additional 5 points for collecting a set of one of each of the 5 colors of Ruins. This may be scored multiple times for multiple sets, and Ruins may be scored both within their type, and within a set of mixed types. Players score points for their Lesser, Greater, and (some) Named Wonders (as indicated on those cards or tokens). Players core an additional 5 points for building three or more Wonders (irrespective of type). In the case of a tie in points, the player with the most Ruins of the highest claim value wins. All Players are tied for the number of 17 value Ruins. Green there- fore wins because she has the most 15 value Ruins.